Pat Tenpenny, 73, was born in Woodbury, TN on July 21, 1945 and rode through the gates of Heaven to be with the Lord on December 13, 2018. Pat lived in St. Cloud, FL. He is preceded in death by mother, Luree McBroom Tenpenny and brother-in-law, Larry Hill. Pat is survived by wife of 5 years, Sharon Tenpenny, brother, Fred Tenpenny; sister, Nancy Hill; nieces, Renee Powell and Jenny Baldwin, nephew, Greg Hill, several aunts, many cousins, and friends. 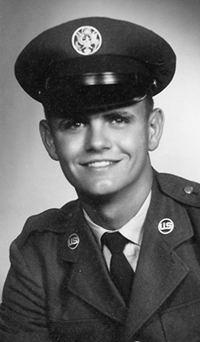 Pat proudly served his country in the United States Air Force from 1963-1965. He was a patriot and loved our country. Pat touched many people with his kindness, generosity, and maybe even shenanigans. He loved to joke and share stories. His almost constant smile and unique laugh will live on in the memories of family and friends. He was a hard worker. Pat lived life the cowboy way, off and on the road, whether he was driving cattle or the crews and entertainers from coast to coast and border to border. He was especially proud of his Southern heritage and he was a member of the Sons of Confederate Veterans.